Knokkers – Billiards & Bowling, Together At Last! | OhGizmo! Knokkers – Billiards & Bowling, Together At Last! I’m sure at some point everyone with a pool table has played a game with their hands. You know, by manually rolling the cue ball at your target instead of using a cue stick? Well that’s the only way that Knokkers is designed to be played. But instead of billiard balls it uses bowling balls. And the table? It’s been scaled up 4X its original size, allowing, and requiring, players to stand on it. The game is the brainchild of Steve Wienecke, a former semi-pro football player and cage fighter, and the first playable version was built in his backyard in Fredericktown, Missouri using loads of railway ties, gravel and of course concrete. The game is played pretty much exactly like standard 8-ball pool, the only real difference is that before your shot you’re allowed to pick up and move the cue ball, though you can’t move your feet once you’ve touched it. Steve is currently working with investors as they design a portable version of the game that doesn’t require a permanent backyard investment, including more durable 6-pound balls that can stand up to the constant collisions experienced during a regular game. Wow. This will be an interesting game. 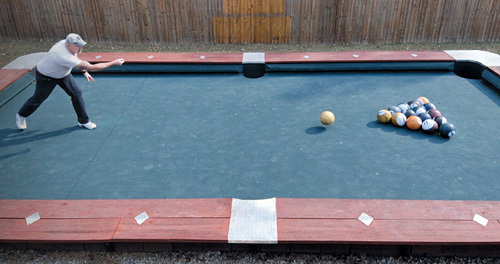 The mix of your skills in bowling and pool will make the difference for this one. I just hope that they succeed on having a durable prototype of the game. Less lawn to mow. Goes right next to the Olympic size pool, next to the horseshoe pit and the tennis courts.